The Daily Pittsburgh Gazette: September 1865. One hundred fifty years ago today, the Philadelphia Athletic Base Ball Club began a scheduled two day series of four games against Allegheny City teams. The Enterprise, Lincoln, and Allegheny Clubs, as well as a picked nine team of the best players from these three teams, all challenged the touring Athletics. 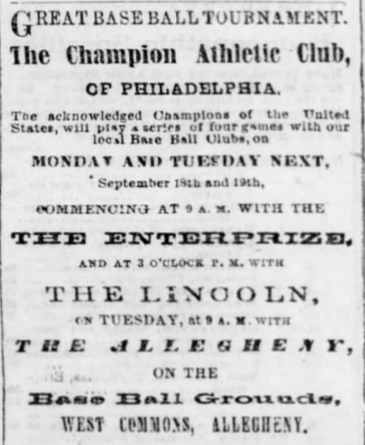 The long-forgotten “Great Base Ball Tournament” played Sept. 18 and 19, 1865 marked the first time an out-of-town club visited the area, the first time a bleacher structure was built for fan seating locally, and likely the first time fans were charged admission to see a game. The end of the Civil War in 1865 spurred a renewed local interest in the game as base ball (as it was then known by two words) flourished in Allegheny City, now known as the North Side and the home of PNC Park. Fans paid 25 cents admission for one game or 50 cents for the series to see local young players compete against one of the best teams in the nation. The Pittsburgh Daily Commercial reported fans cheered from seats erected by the “Committee of Arrangements” at “considerable expense” on West Common, an area of what would later become known as the Allegheny Commons. Today it is a park opposite the corner of the Community College of Allegheny County’s Allegheny campus that remarkably still remains undeveloped. Philadelphia Athletic Club cloth uniform piece, presented to a Lincoln club opponent, 1865. Image courtesy of Heritage Auctions. The Great Base Ball Tournament likely confirmed the profitability of charging admission to watch baseball games in what the Gazette called an “amphitheater.” Union Skating Park opened nearby and in 1867 it was converted into the first ballpark in the area, Union Park. A new Allegheny team later began play in the American Association in 1882, led by founding owner Denny McKnight, brother of former Enterprise catcher Woodruff and son of Congressman Robert McKnight. Union Park’s name was changed to Recreation Park in 1885. 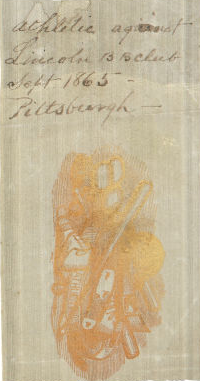 Six years later, the Alleghenys would gradually become known as the Pittsburgh Pirates. The rivalry between the Pirates and the Philadelphia Phillies (formerly the Quakers) is nearly 130 years old, with the Pirates currently ahead with a 1,207-1,054 record. Craig Britcher is a project coordinator with the History Center & the assistant curator of the Western Pennsylvania Sports Museum.